With thanks to Yvette Rayner, PR Account Manager, Frasermedia Ltd.
A blind fundraiser is about to conquer a challenging obstacle course as part of a year-long programme of endurance challenges. Neil Skene, who is fundraising coordinator for North East Sensory Services (NESS) is taking on the Prime Four Banchory Beast Race this Saturday at Knockburn Loch, Banchory, as part of a group of 10 NESS supporters. NESS, which has offices in Aberdeen, Elgin and Dundee, supports over 6500 people who have serious sight and or hearing loss. The charity relies heavily upon fundraising, and Mr Skene organises a number events as well as taking on a number of challenges himself, along with colleagues and friends. The fundraising co-ordinator, who is also Scotland’s only blind comedian, is taking on eight different running challenges in 2017, raising money for the charity which provides advice and practical support to people with sensory impairment. Having climbed Kilimanjaro in 2014, Mr Skene enjoys pushing himself and proving that, with the support of friends, nothing stops him from taking part in extreme challenges. He started the year early with the Lumphanan 10k detox race on 2nd January, and then took on the tough Run Garioch run on 26th March, followed in May by the 5k Dunecht Dash. June saw Mr Skene, along with his running guide who is tethered to him by a piece of rope, join the 10k Fettermear race, before increasing training in time for the Simplyhealth Great Aberdeen Run in August. Next for Mr Skene is the super obstacle race that is the Beast. An epic 10k race over tough Scottish terrain, the Prime Four Banchory Beast Race involves 25 mega obstacles, giant water slides, icy loch water, thick mud and swamp crossings. Mr Skene and his team took part in 2016, working together to guide Mr Skene and his colleague, Leona Glennie, who is deafblind. Not content with having taken part in Aberdeen’s first ever half marathon, Mr Skene is looking forward to beating his 2hrs 3mins time by tackling the Great Scottish Run in Glasgow on 1st October. “It has been a fantastic year, with a great number of friends and colleagues getting out and about to raise money for NESS. We rely on donations and sponsorship to help us provide social groups, activities and information for blind and deaf people in the north-east. Neil Skene and the NESS team can be sponsored at http://bit.ly/2f6Ed7I. With thanks to Ian McLaren, PR account manager, Innes Associates. Visitors from around the world flocked to the small Aberdeenshire village of Bellabeg last Saturday (26 August) to witness one of Scotland’s most iconic spectacles. For the 176th time, the Lonach Highland Gathering and Games took place in the picturesque Strathdon valley and with it a tradition that stretches back nearly 200 years. Dressed in full highland regalia, 170 kilted Lonach Highlanders followed in the footsteps of their forefathers to celebrate the history and heritage of the local area. Armed with eight-foot long pikes and Lochaber axes, and carrying the colourful standards of the Lonach Highland and Friendly Society, the men, led by the pipes and drums of the Lonach Pipe Band, set off at 8am to embark on a six-mile march en route to the Highland Games. Along the way, the parade halted at six properties. At each, with a dram of whisky and to the cry of ‘Ho Ho Lonach’, the men toasted the health of the property’s owners, the society and the local area. 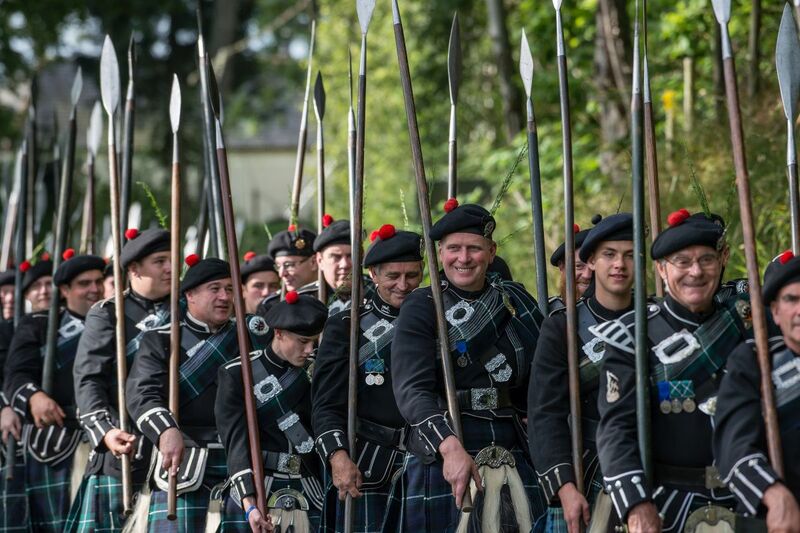 At one o’clock the Highlanders marched into Bellabeg Park to officially open the 176th Lonach Gathering. They were greeted with enthusiastic cheers and applause from a crowd estimated at 7,500 which packed the grandstands and stood five to six deep in places around the arena. The day was blessed with bright sunshine and warm temperatures, only interrupted by occasional light showers in the morning. Following the Lonach Highlanders every step of their march, pulling the traditional ‘cairt’ was Socks, the Lonach horse. Owned by Derek Gray of Kildrummy, the eight-year-old Irish Heavy Cob was making his third appearance at the gathering and received a hearty reception from the spectators. Organised by the Lonach Highland and Friendly Society, the Lonach Highland Gathering and Games has been held annually since 1832, except during the years of the first and second world wars. Staged on the fourth Saturday of every August, the event gives a huge boost to the local area. Visitors travelled from throughout the UK and overseas to experience the unique and emotive march of the Lonach Highlanders and soak up the friendly atmosphere at one of Scotland’s leading Highland Games. A packed programme of over 70 events featured throughout the day. There were displays of strength and stamina in the light and heavy athletics, and intricate footwork on the highland dancing boards. Solo pipers and four local pipe bands provided a musical soundtrack for proceedings. The popular four-mile hill race attracted a field of 70 runners. Henry Gordon-Hart from London won the men’s race, while the first female home was Stephanie Provan of Aboyne. Also taking part in the hill race was Lonach Highlander George Reid. The 63-year-old from Tomatin went on to compete in the inaugural Great Aberdeen Run 10k race the following day wearing his Highlanders’ uniform. A strong field of entrants featured in the heavy events, which saw a new shield being competed for in the open caber event. The shield was presented to the Lonach Highland and Friendly Society by the family of Society stalwart Rob Walker who died earlier this year. Mr Walker who farmed in Strathdon his entire working life, was a member of the society for 70 years, having first joined in 1947. Lukasz Wenta from East Kilbride received the shield from the family after winning the open caber event. The ladies tug o’ war competition was again fiercely contested, with the Glenbuchat Ladies proving victorious over Lonach Ladies and the Rest of the World team made up of ladies from throughout the UK and overseas. Illustrating the international draw of the Lonach Gathering were two photographers from the National Geographic magazine. The duo, who photographed the event in 1991, returned to capture proceedings for an upcoming Dutch edition of the publication. Three new Lonach Highlanders took part in the march for the first time. They are among six new members of Lonach Highland and Friendly Society, whose membership currently numbers 227. The oldest Lonach Highlander marching was 77-year-old marshalling sergeant George Thomson from Strathdon. “The spectacle of Lonach and the march of the Lonach Highlanders never disappoints. Bellabeg was abuzz all day and it is wonderful to see. Every year, I look round the arena as the Highlanders march past and without fail there are beaming smiles and emotional faces in equal measure amongst the crowd. Lonach tugs at the heartstrings. The story behind a mysterious photograph unearthed last year has finally been uncovered as an Aberdeenshire community prepares to stage its annual Highland Games. 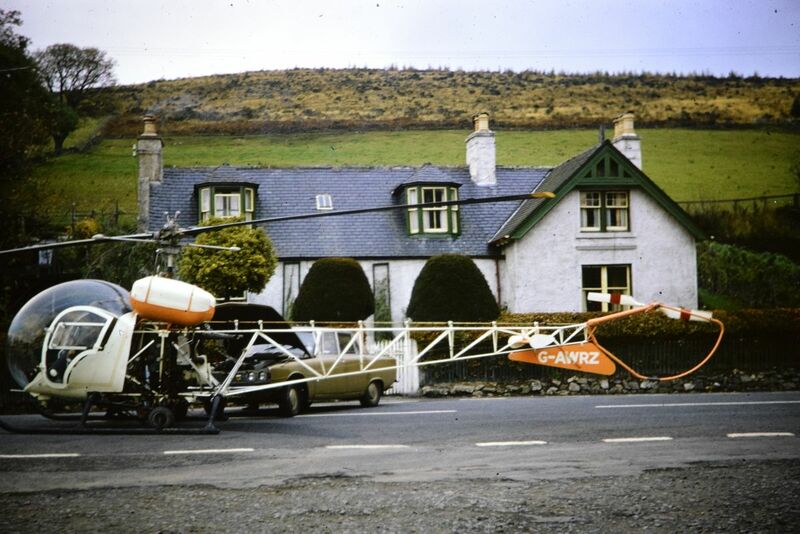 Amongst a bundle of old slides donated to the organisers of the Lonach Highland Gathering and Games was an intriguing picture of a helicopter apparently being jump started by a car on the A944, the main road through the village of Bellabeg where the gathering is held. Now months after calling for the public’s help and having explored a number of leads, the tale of the baffling picture has been revealed. And a member of the Lonach Highland and Friendly Society was the person who held the answers to Strathdon’s curious chopper case. In 1974, James McIntosh, who was brought up in Strathdon and runs The Lecht Ski Centre, was working for Sunningdale-based Yellow Bird Air Services which owned the Bell 47G-5 helicopter. The firm was contracted to spread fertiliser on young trees on the Isle of Mull and as the helicopter was due a service, James and American pilot Don Ambabo decided to head to Strathdon for the weekend and carry out the service there, before they flew to Mull. Assisted by the local policeman, who held up the traffic, the pair landed on the road on the Friday evening before wheeling the helicopter to the cover of the local garage. Over the weekend, James and Don serviced and washed down the helicopter with the help of fellow Lonach Highlander Archibald Stuart. When they manoeuvred it back out on Monday morning for take-off, things didn’t quite go to plan. “We wheeled the chopper out onto the road and went to fire up the engine and there was nothing. It was a piston driven engine which can sometimes be difficult to start, especially after being hosed down and cleaned. Knowing that the local bus and other folks would be needing past soon we had to act quickly. “As the battery on the helicopter is fairly small a car can jump start it, so I hijacked my father Gibbie’s Rover. The road was at a standstill for about 10 minutes while we got the helicopter off the ground. There were a few bemused drivers and some of the locals were peering out their doors to watch proceedings. It’s not every day a helicopter uses the main road through Strathdon as a helipad. 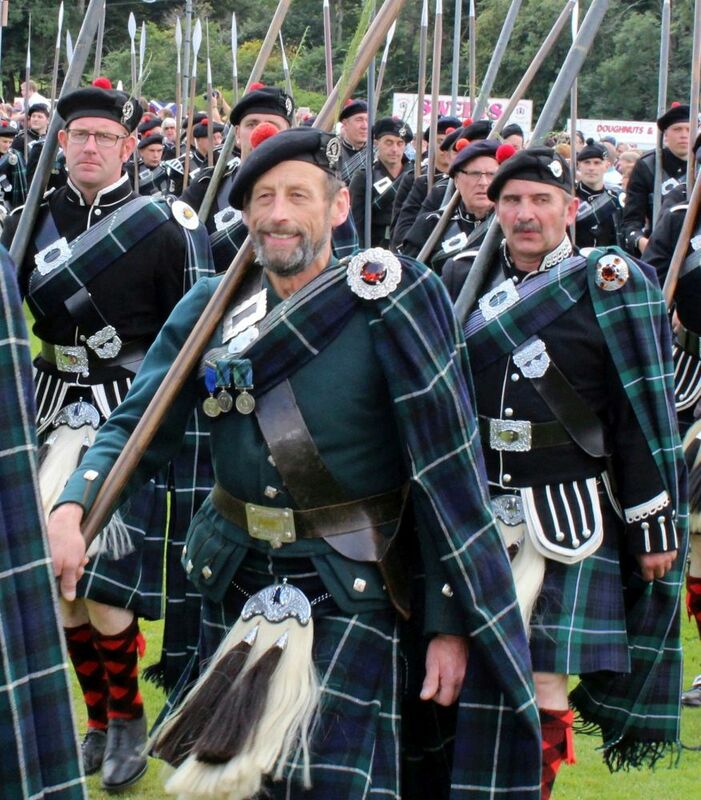 This Saturday will see a different spectacle take-off along the A944 in Strathdon when around 170 Lonach Highlanders undertake their annual six-mile march to the Lonach Highland Gathering and Games. Setting off at 8am, the men will visit a number of local properties to toast the health of their owners and the local area, continuing a near 200-year-old tradition. The Highlanders’ arrival onto the games field at one o’clock heralds the official opening of the Highland Games. It’s a route that James has trod many times, having taken part in the march for 51 years as a drummer in the Lonach Pipe Band. He first marched aged nine, before joining the Lonach Society at 16, eventually hanging up his drumsticks in recent years. Forty years ago, after a spell in the Fleet Air Arm and flying helicopters privately, James set up The Lecht Ski Centre alongside Pieter du Pon, Ronnie Winram and Professor Jim Petrie. Since its founding in 1977, the centre has grown to become one of Scotland’s main ski centres and a year-round activities destination. “It is brilliant to be able to discover the story behind the photograph, as it certainly had us scratching our heads when we found it. Being confronted with around 200 men in kilts carrying pikes isn’t unusual on the road in Bellabeg, but a helicopter certainly would have been. George Reid (foreground with green jacket) dressed in his Lonach Highlanders outfit. One of the runners taking part in this Sunday’s inaugural Simplyhealth Great Aberdeen Run will have one of the most unusual warm-up routines of any participant. George Reid of Tomatin will take part in a six-mile march and a four-mile hill race the day before he competes in the Simplyhealth Great Aberdeen Run 10k race. The 63-year-old is a member of the Lonach Highland and Friendly Society, which holds its annual Highland Gathering and Games on Saturday, 26 August in the Aberdeenshire village of Bellabeg. The event features the unique march of the Lonach Highlanders, a six-mile march through picturesque Strathdon that continues a near 200-year tradition. Dressed in full Highland regalia and armed with an eight-foot long pike, George will join around 170 other men as they visit a number of local properties where they toast the health of the owners and the local area. With a membership numbering 227 men, the Lonach Highlanders are believed to be the largest body of non-military men to carry ceremonial weapons in Britain. Clad in tartan, with pikes aloft, banners flying and led by a pipe band, the Highlanders create one of the most iconic cultural spectacles in north-east Scotland. 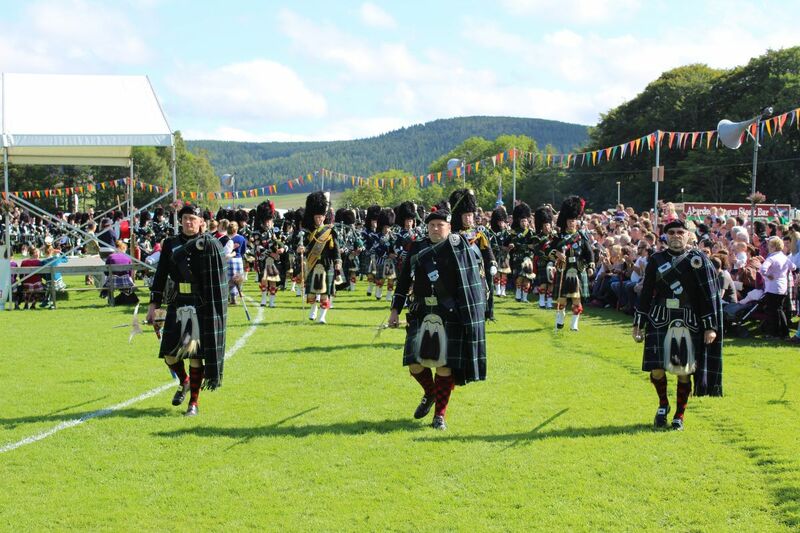 Getting underway at 8am on Saturday morning, the march precedes the Lonach Highland Gathering, which commences at 12 noon and features piping, highland dancing, tug o’ war, children’s races and light and heavy athletics events. Having marched six miles and enjoyed a hearty lunch, George will join a field of around 100 runners of all ages to compete in the event’s hill race. Runners interested in participating in the race, which is free to enter and features a £75 first prize, can enter on the day. The challenging four-mile off-road course features a steep ascent as it winds its way round the hillside forest. It’s a course that George knows well, having competed in the race 17 times, winning the competition for Lonach Society members six times. For a man who has completed a number of marathons, ultra-marathons and is a member of Triathlon Inverness, the Saturday march and hill race will be ideal preparation for the Great Aberdeen Run, which he will run in his Lonach Highlanders uniform. “I started running about 19 year ago and haven’t really stopped. I run about four times a week and love it. I’ve covered all sorts of distances, including marathons in Edinburgh, London and Dublin, the 53-mile Highland Fling ultra and the 50-mile Highland Cross duathlon. The Lonach Highland Gathering and Games takes place in the Aberdeenshire village of Bellabeg, which is around an hour’s drive from Aberdeen. Events on the Highland Games field get underway at 12noon, with the Lonach Highlanders marching round the arena at 1pm and 3pm. Tickets are priced from £10 for adults and £4 for children. Established in 1823, by Sir Charles Forbes, 1st Baronet of Newe and Edinglassie, the Lonach Highland and Friendly Society is a charitable organisation based in Strathdon, Aberdeenshire. The society organises the annual Lonach Gathering at Bellabeg Park, Strathdon, which is held on the fourth Saturday of August. The main attraction at the gathering is the march of the Lonach Highlanders, a unique body of non-military men. Further information on the Lonach Highland and Friendly Society, the Lonach Highlanders and the annual Lonach Highland Gathering can be found at www.lonach.org. Owners of The Lounge, Kelly Daun and Norman Hatton keen to get involved with the event. An Aberdeenshire salon is showing its commitment to the local community by supporting cyclists in the region’s newest bike ride. In a bid to boost morale and community spirit, staff from The Lounge at Chapelton, near Newtonhill, will be providing complimentary leg and shoulder massages to cyclists at this year’s Chapelton Bike Ride. Taking place on Sunday, September 3, the bike ride is held in aid of North East Sensory Services (NESS) and is returning to the village of Chapelton for the second year in a row. Last year, over 250 cyclists took part in the inaugural Chapelton Bike Ride, raising over £6,500 for NESS. NESS, which has offices in Aberdeen, Elgin and Dundee, supports over 6,000 people in the North-east who have sight or hearing loss. The charity helps those with a sensory impairment to overcome the practical and emotional effects of serious sight and/or hearing loss, as well as guiding them to achieve more independence. Starting and finishing in Chapelton, the event’s 12-mile and 42-mile bike rides, as well as the newly launched 5K walk, will take participants around the picturesque Aberdeenshire countryside surrounding the area. On completion of the bike rides, weary cyclists will then be treated to a variety of treatments from The Lounge that will help their muscles to recover faster. They will also receive a gift bag containing discount vouchers and other goodies. Owners of The Lounge, Kelly Daun and Norman Hatton, both reside locally and were keen to get involved with such a large community event. The salon hadn’t opened at the time of the first Chapelton Bike Ride, so they felt it was important to give their support to cyclists fundraising for NESS. 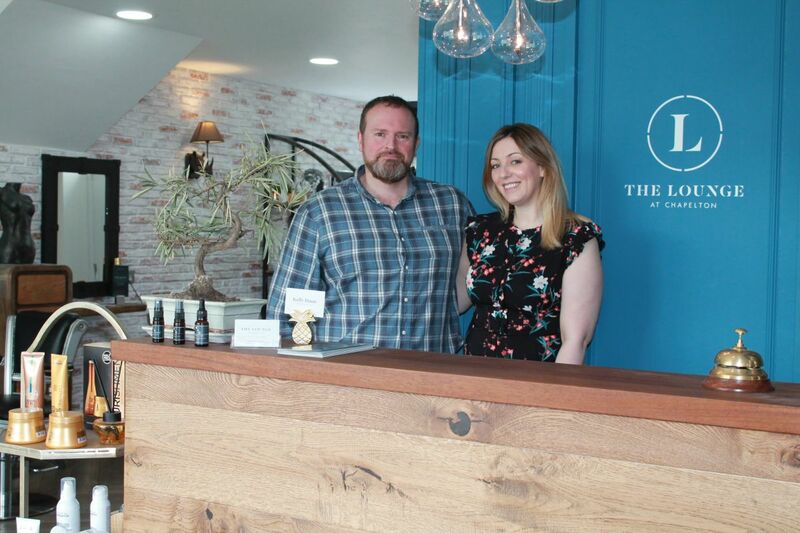 “Since the salon opened, we’ve been warmly welcomed by Chapelton residents and other local businesses. The Chapelton Bike Ride is a great way for us to give something back to our community, as well as providing a nice incentive to cyclists who are raising money for a very worthy cause. “We’re very thankful to the team at The Lounge for volunteering their services on the day of the Chapelton Bike Ride. We are aiming to make this year’s bike ride a fun day out for all the family and have already improved the range of activities on offer, so the complimentary massages will only add to this experience. “All funds raised by cyclists, walkers and spectators will enable us to continue supporting our service users to overcome the practical and emotional effects of sight or hearing loss, so we are extremely grateful to all of those taking part. The Chapelton Bike Ride, formerly the Great Stonehaven Bike Ride, is taking place on Sunday, September 3, and is raising funds for North East Sensory Services (NESS), a charity that supports over 6,000 sensory impaired people in the North-east. North-east Sensory Services (NESS) promotes the needs of people with a sight or hearing loss. NESS supports people with serious sight or hearing loss to overcome practical and emotional challenges and achieve independence. Formerly Grampian Society for the Blind (GSB), North East Sensory Services (NESS) works with over 6,000 people with a sensory impairment in Aberdeen, Aberdeenshire, Angus, Dundee, Elgin and Moray. 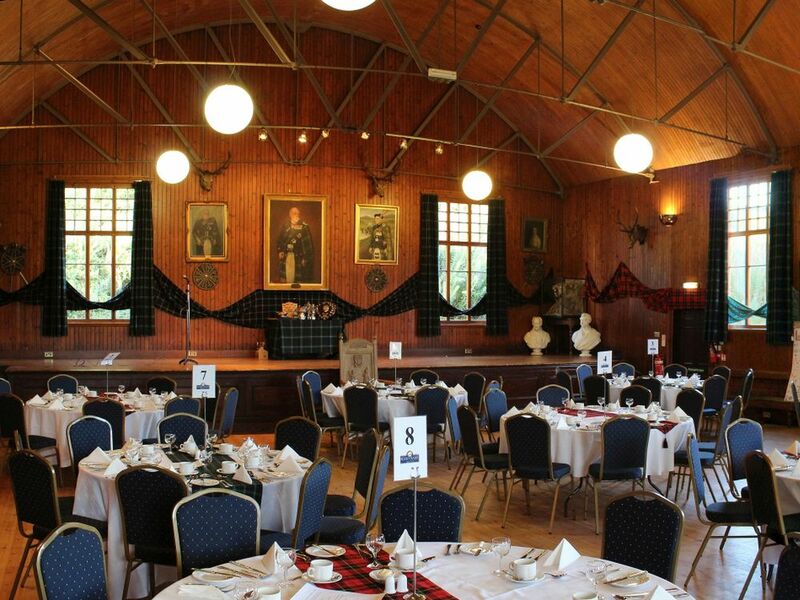 The Lonach Hall set for the Annual Highland Ball. Highland ball aficionados from across Scotland are being invited to attend one of Aberdeenshire’s oldest and most popular social gatherings. The Lonach Highland Ball has been held in Strathdon, Aberdeenshire since 1833, and provides an opportunity for guests to celebrate the achievements of competitors at the annual Lonach Highland Gathering and Games. Tickets for the black-tie event have just gone on sale and organisers, the Lonach Highland and Friendly Society, are keen to encourage a whole new generation of traditional Scottish dance enthusiasts to come along and sample the unique hospitality on offer. Around 140 people attend the formal annual event. However, a press cutting from 1927 illustrates how popular the ball was 90 years ago, when it was reported that around 500 people attended that year’s event. Held in the magnificent barrel-vaulted Lonach Hall in Strathdon, the Lonach Highland Ball is one of the highlights of the Strathdon social calendar. Along with guests from the local area, the evening attracts people from across north-east Scotland and further afield. Guests to this year’s ball on Friday, 01 September will enjoy a four-course meal served by Harry Fraser Catering and dancing to the Graeme Mitchell Scottish Dance Band. Tickets are priced at £40 per person. The black-tie event sees some of the trophies that were contested at the previous week’s Lonach Highland Gathering and Games presented to competition winners. Featuring the impressive march of the Lonach Highlanders, Lonach Highland Gathering and Games is one of Scotland’s most iconic highland games. Staged annually on the fourth Saturday in August in the Aberdeenshire village of Bellabeg, the gathering features over 75 competitions in highland dancing, piping, light and heavy athletics and tug o’ war. This year’s gathering takes place on Saturday, 26 August. “The Lonach Highland Ball is a fantastic night and an important part of the fabric of the society and the local community. We are keen to ensure it continues to be for decades to come, in the same way it has since the 1830s. “It provides an opportunity for everyone to celebrate the achievements of competitors at the previous week’s gathering and the success of the gathering itself. Guests from across the north-east attend the ball, with some travelling out from Aberdeen for the evening, which is testament to the calibre of the event. Anyone interested in attending the Lonach Highland Ball should contact Jennifer Stewart by e-mailing secretary@lonach.org. With thanks to Aberdeenshire SNP. Fergus Ewing MSP at Braemar Castle with local councillor Geva Blackett and West Aberdeenshire & Kincardine SNP candidate Stuart Donaldson. Braemar villagers have been hailed as local heroes by leading politicians as examples of how community empowerment works as they celebrate ten successful years of community management of Braemar Castle. Braemar Community Limited have seen visitor numbers to the 17th century castle soar by over 277% since they took on a 50-year lease on from Invercauld Estate in 2007. Raising over £500,000 to renovate the building in the past ten years and – as well as repairing the roof – they now have 12 fully-furnished rooms. And this weekend the community celebrates a decade of delivery for the iconic tourist attraction with a dinner and hog roast ceilidh. 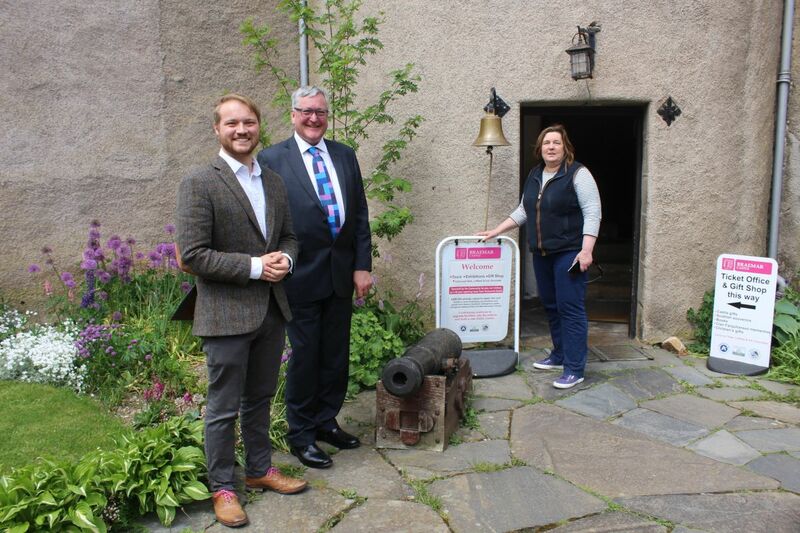 Scottish Government’s Cabinet Secretary for the Rural Economy Fergus Ewing MSP visited the castle on the eve of the party, with local councillor Geva Blackett and West Aberdeenshire & Kincardine SNP candidate Stuart Donaldson. “It’s always a great pleasure to visit Braemar as there is so much going on. “It’s a truly vibrant community and the work they have done in restoring and improving the castle typifies that. “Braemar is a small but historic village and there has been terrific buy-in from a huge section of the community to bring visitors back to the castle. “They are true local heroes who can be immensely proud of the work they have done to restore, improve and promote Braemar Castle. Councillor Geva Blackett, whose husband Simon is chair of Braemar Community Ltd the community company who run the castle and other projects, is thrilled at the progress they have made since 2007. The Earl of Mar initially used the castle as his Highland hunting lodge but after it was partially burnt down in 1689 after becoming the first casualty of the first Jacobite uprising. The castle has changed several times over the years with a long-list of high profile owners – including a Russian princess and an MP. Aberdeenshire’s Lonach Highlanders are set to make a mark as they debut at this year’s Royal Edinburgh Military Tattoo. Seventy-five of Strathdon’s kilted clansmen will travel to the capital in August to be part of the iconic annual spectacle as it celebrates Scotland’s clans. The men have been invited to be part of the performance on Monday, 14 August by Lord Forbes, chief of the Forbes clan. In front of an audience of around 8,500 people, including many international visitors, the highlanders will parade onto Edinburgh Castle’s Esplanade to herald the start of the evening’s performance. Dressed in full highland regalia and armed with their traditional eight-foot long pikes, the men will create an imposing sight for the gathered crowd. With a history stretching back to 1823 when the Lonach Highland and Friendly Society was formed, the Lonach Highlanders are believed to be the largest body of non-military men to carry ceremonial weapons in Britain. Membership is drawn from residents of the local area who descend from the Forbes, Wallace and Gordon clans. Society membership currently stands at 227 men, under the patronage of Sir James Forbes, 8th Baronet of Newe and Edinglassie. The theme of this year’s Tattoo is a Splash of Tartan, something that the Lonach Highlanders will admirably provide. To mark Scotland’s Year of History, Heritage and Archaeology, Tattoo organisers have teamed up with The Standing Council of Scottish Chiefs to celebrate the country’s clan heritage and national fabric, and their influence around the world. Two or three clans will be represented at each performance during the Tattoo’s three-week run. On the night of the Lonach Highlander’s attendance, both the Forbes and Wallace clans will muster on the castle esplanade and their Scottish ancestry celebrated. The highlanders’ trip to Edinburgh comes just 12 days before their own annual gathering takes place in Bellabeg, Aberdeenshire. Attracting crowds of up to 10,000 people, the Lonach Highland Gathering and Games is one of north-east Scotland’s leading traditional highland games. This year’s event on Saturday, 26 August marks the 176th time the gathering has been held. It will once again commence with the Lonach Highlanders embarking on six-mile march round the local area, following in the footsteps of their forefathers and continuing a near two-hundred year-old tradition. “The Lonach Highland and Friendly Society is honoured to have been invited to participate in this year’s Royal Edinburgh Military Tattoo. This is the first time that the Lonach Highlanders have been present at the event and there is huge excitement amongst those taking part. “This is a fantastic opportunity for the society and the highlanders to help promote our history and heritage, the Lonach Gathering, Aberdeenshire and highland games in general. Television recording will be taking place on the night that we are parading. If we make the director’s cut then there is potential for millions of people around the world to learn about Lonach. Ringside seat tickets for the 176th Lonach Highland Gathering and Games are on sale now, priced from £12 for adults and £7 for children. Visit www.lonach.org for full details. Established in 1823, by Sir Charles Forbes, 1st Baronet of Newe and Edinglassie, the Lonach Highland and Friendly Society is a charitable organisation based in Strathdon, Aberdeenshire. The society organises the annual Lonach Gathering at Bellabeg Park, Strathdon, which is held on the fourth Saturday of August. The main attraction at the gathering is the march of the Lonach Highlanders, a unique body of non-military men. Further information on the Lonach Highland and Friendly Society, the Lonach Highlanders and the annual Lonach Highland Gathering can be found at www.lonach.org. With thanks to Aberdeen Community Energy (ACE). Donside Hydro is a community built hydro scheme, on the river Don adjacent to the site of Donside Papermill, where there is now an urban village. In 2013 Local residents formed a resident’s association, now called Donside Village Community SCIO (DVC), and from this association, ACEnergy (a not for profit, community benefit society) was formed. For anyone interested in visiting Scotland’s first Urban Community Hydro Scheme, a tour is being conducted on Thursday May 18 ( details below). ACEnergy (whose 5 directors all live in the village and are members of the DVC, bar one) went on to create the £1.2 million Donside Hydro Scheme, which has been successfully funded through share and bond offers. The scheme has won a number of awards since operations began last September, including the best Community Project at the Scottish Green Energy awards in December. Whilst the turbine is fully operational, and we have been producing electricity since 21st Sept 2016 and are meeting all projected targets, the landscaping is ongoing and there is still a bit of work to be done. We have just finished planting over 500 trees on our newly created island and further landscaping will take place over the next year. This will include the building of a bridge across to the island, and ensuring that as much of the area as possible is wheelchair accessible. Profits from the scheme will be given to the share holders and bond holders, who have helped to finance the scheme, but a percentage of the profits will be returned to the community association, and this will be used to further develop the area and create a lovely public amenity for all who come to this part of the Don. However, this will not happen until the first full year of production at the earliest. The DVC is working with the Scottish Government’s Scottish Land Fund to purchase the land surrounding the Donside Hydro. The aim is deliver a park for locals and visitors of all ages to play, explore, recreate and educate. We are at stage 2 of our application and it is progressing well. However, the Scottish Land Fund are unable to fully finance any land purchases and can only give us 90% of the value of the land. We are not yet in a position to access any funds from the electricity production, as stated above, so this means we will have to find the remaining monies ourselves. We are currently fund raising at every opportunity to raise the necessary cash (e.g. all profits from our Spring Fayre has gone toward the land purchase, people from the village are running the 10k to raise money etc). We are also seeking alternative ways of funding and have started to charge for seminars and tours, where it is reasonable to do so, whilst keeping in mind our desire to make the hydro as accessible as possible to all. Therefore we are asking groups who ‘have a budget’ to make a set fee. For those that do not we are asking individuals who attend to make a donation in order for us to be able to purchase the land and develop it for all. The bottom line is, we want people to be able to come and see the hydro and hear our story. We do not want money to be a prohibitive factor, but we want to be able to purchase the land! Visit the first Urban Community Hydro Scheme! 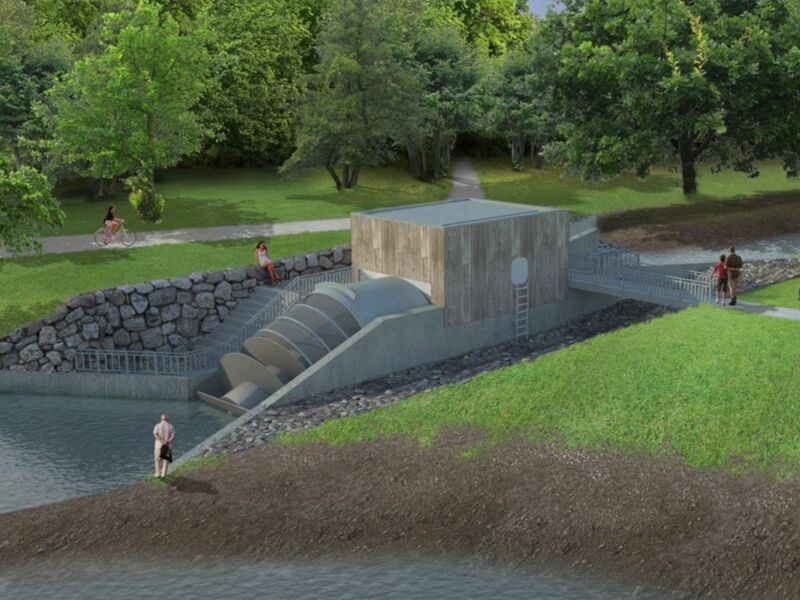 On Thursday 18th May at 7pm please join Aberdeenshire Environmental Forum on their visit to the first urban community hydro scheme which is a 100Kw Archimedes screw by the banks of the River Don by Tillydrone, Aberdeen. Come and find out how this scheme works and environmental issues that need to considered in such schemes. The visit is free but donations to the scheme are most welcome. Please book a place on this tour by telephoning or texting 07799658209 as limited spaces and to organise lift sharing opportunities. (L to r) Pastor Neil Cameron of Apex Church; Cllr Stuart Pratt and Cllr Stephen Smith. Local SNP councillors Stuart Pratt and Stephen Smith have shown their support for Peterhead FC’s impressive range of community engagement programmes. 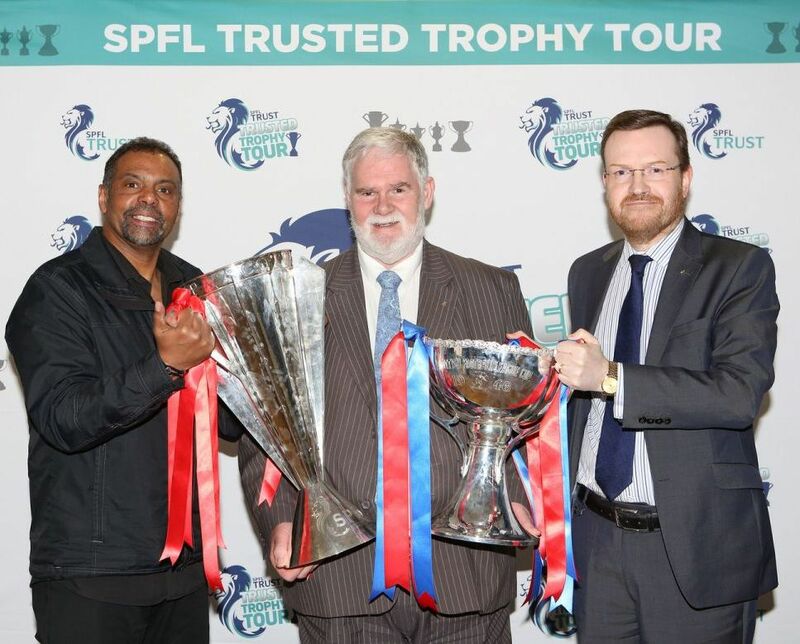 The club launched a new initiative with Peterhead Boys Club to give away 200 free season tickets and made presentations to the latest graduates of the ‘Football Fans In Training Programme’ at an event at Balmoor this week where the various national football trophies were also on display. “Peterhead Football Club do a huge amount throughout the year in terms of youth engagement and supporting their local community. But even someone like myself who manages to attend most of Peterhead’s home games didn’t realise quite how much the club actually does.